So much change occurs in your baby's first year. She will have frequent doctor check ups or well baby visits to keep tabs on her rapid development. You should also see these appointments as time for you to seek support from your baby's health care provider. The following is what you can expect at your baby's first pediatrician appointments. Your baby's pediatrician will most likely want to see her soon after birth depending on her weight fluctuation after birth, jaundice, and feeding concerns. You will go back again at one month, two months, four months, six months, nine months, and twelve months old. 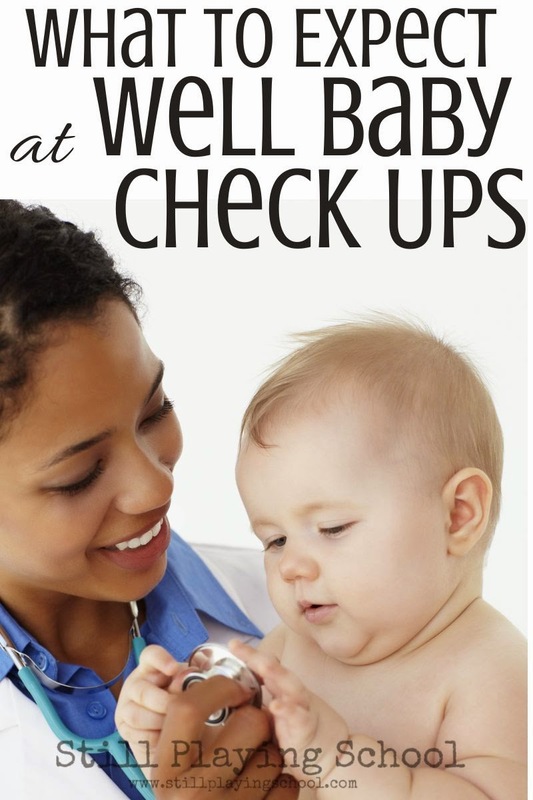 The doctor will check your baby's fontanelles (soft spots) and muscle tone. Your baby's heart, lungs, diaper area, eyes, ears, and mouth (and teeth) will also be checked. Vaccines will be given at your discretion. You may want to do research before your appointments to decide how you feel about the typical schedule for vaccines, the delayed schedule, or choosing not to vaccine at all. Your doctor will also have advice for you. You can expect questions about how your baby is eating, sleeping, dirtying diapers, socializing, and babbling. Use this time to ask your doctor any concerns you may have at this time! As your child grows the doctor make ask her to complete simple developmental tasks. Verbal children are sometimes asked about their own self care habits and interests.